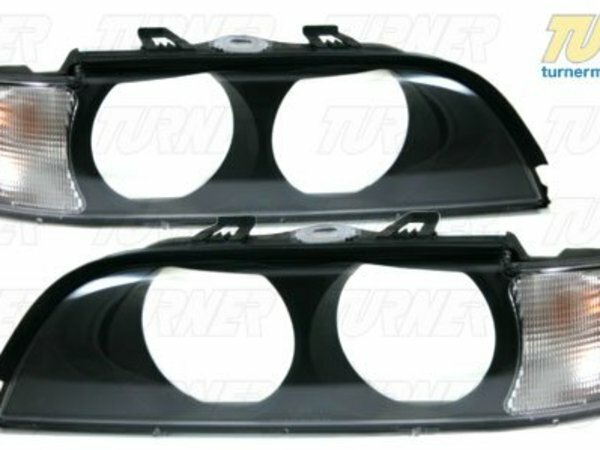 Original BMW front headlight lenses with Euro clear turn signals (pair) for 1997-2000 BMW E39 528i, 540i. Excellent fit and finish, these are a direct replacement for your stock lenses and parking lights. These are not just a great improvement to the look of your car, the new plastic lens will also improve your lighting if your current lenses are pitted, scratched, or faded. Amber bulbs included or choose the Stealth bulbs for a cleaner look. Not for cars that have the factory (Celis) Angel Eye halo ring headlights.